I've long been fascinated with origami, paper art, and koi. Through out college I've designed poseable koi out of wood, and folded origami koi out of a single sheet of paper. 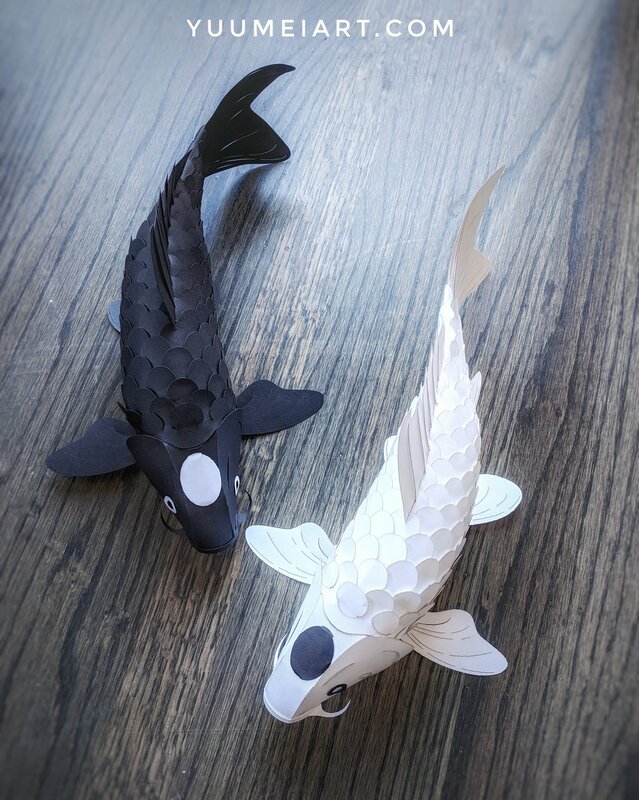 Since Feb of 2017, I've wanted to design poseable paper koi lanterns without using glue or tape. I ran into a lot of design blocks and gave up for a year. Then late Jan of 2018 I suddenly got inspiration from diy Ikea lamps. 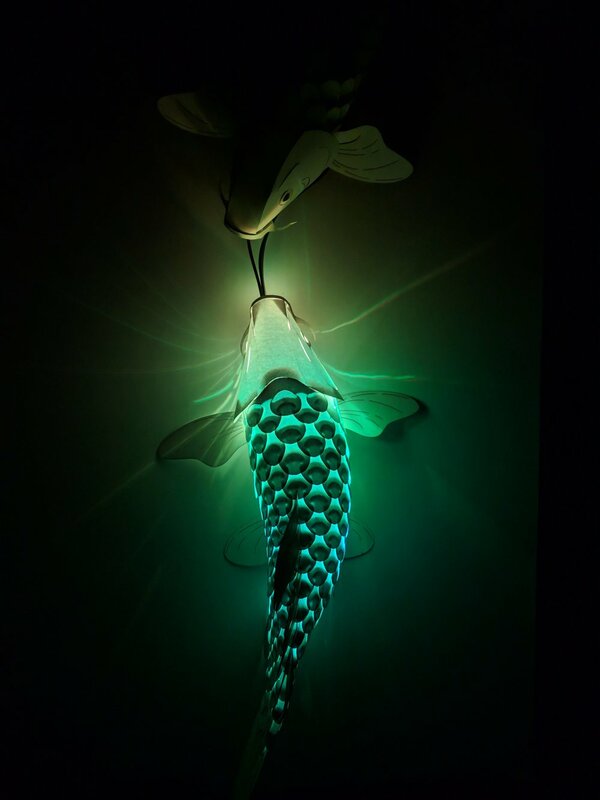 The way the lamp pieces interlock became the bases of how the koi fish's scales interlock. The scales are designed to hold each other together, and yet be loose enough to bend and pose the koi. The entire build is surprisingly sturdy, and I had a lot of fun playing with the fish, bending them in all directions, and throwing them around. They hold up through all my abuse. The poses hold very well, and you can hang the fish from its mouth and it won't unbend at all. Below are some of the current wip designs. I make the designs in Adobe Illustrator before laser cutting them out (die cutting also works). I'm still fine tuning minor details before selling diy kits in my shop. Below is the first prototype of a butterfly koi. Butterfly koi are a type of koi with extra long fins. I love the flowing elegance of their long fins and have always wanted one. My hand for scale on how big they are. Their current size is limited by the cheap 8.5 x 11 inch plain cardstock that I cut them from. Below are even older prototypes, 2 of the first full koi I made. And below is even older prototype without a head and place-holder fins. I stuck a desk light into it's headless neck to test out how well it works as a lamp. Future plans for the designs include adding decorative colored scales that can be easily put on the koi or removed so you can customize your own koi patterns. And also getting cool metallic paper hehe :) (right now they're made from cheap, plain cardstock) I'm excited to have a whole school of them swimming around the house and all light up. With the right programming, the entire school of fish can light up in synchronized patterns. The future is bright with koi light!